On the other hand, I use OS X for my primary work, but again, sometimes there's no way around Windows. So I had the same Windows installed again within VirtualBox. The best and most complete one is IMHO luckypiplav's howto, as it already covers most of the issues and caveats. So my today's post will be sort of an aggregate of all these posts before. I'm not trying to duplicate, my focus is to show what I had to do to get my setup working for me. I'm not going to loose big words on this. 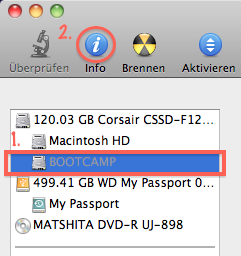 I used the Boot Camp assistant to prepare the hard drive for installation. The process is straight forward. For those not so familiar with it, here's a howto. So, let's start on looking up the partition information first. For this you need to launch Disk Utility first. 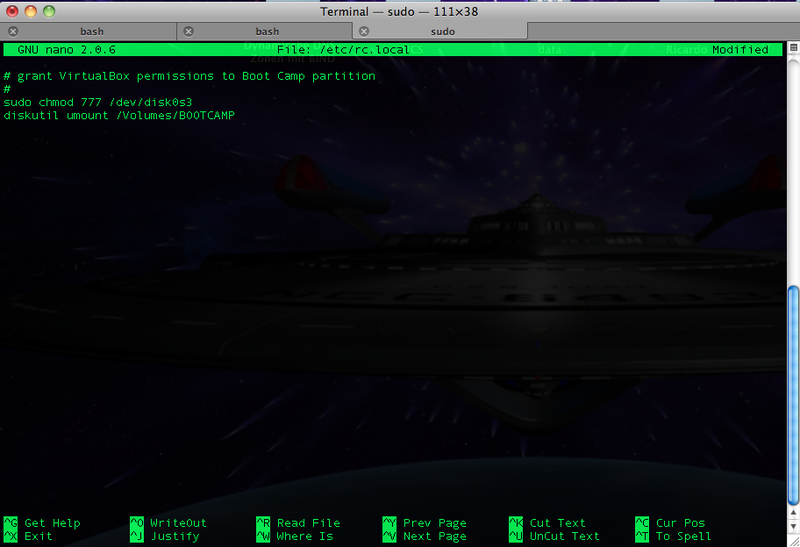 On the main window, click your Boot Camp partition first and the "Information" icon second. This will reveal the partition information. The most important thing for us to work with, is the partition ID, which in my case reads "disk0s3" (first disk, 3rd slice). In most cases this will be identical for you, but chances are, that it's not. If it reads something different for you, then use this instead. Now open up Terminal. Your starting directory in Terminal is usually your home directory, which evaluates to /Users/USERNAME. In my case it's /Users/Gianpaolo. You can always verify your current location using the "pwd" (Print Working Directory) command. 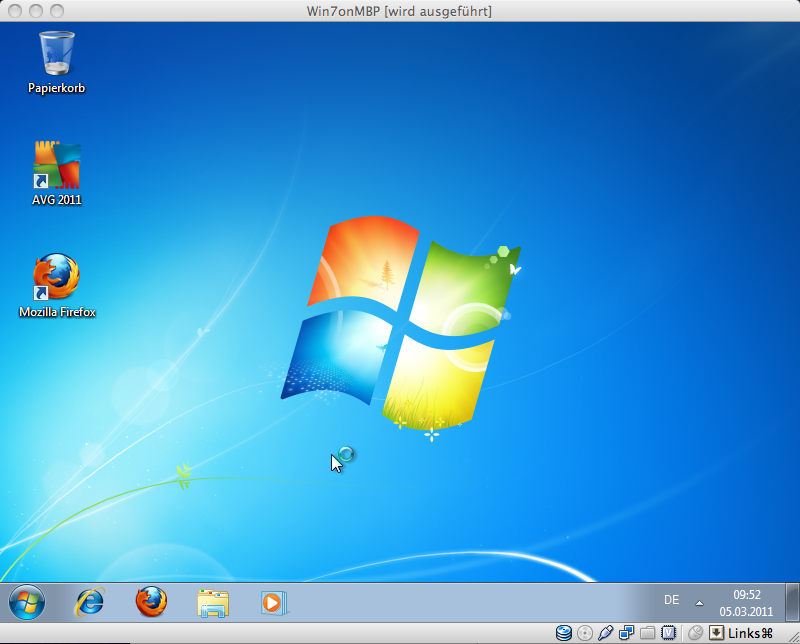 I store all my VM related stuff in my home directory in a folder called "VirtualBox VMs", so I change to this directory and create a new folder for the new Windows 7 VM. Now, we need to grant permissions to the partition we inspected before. Rembember, mine was "disk0s3"? Don't forget to use the one, that correctly applies to your system. You will also need to eject the Boot Camp volume, in case it's mounted. 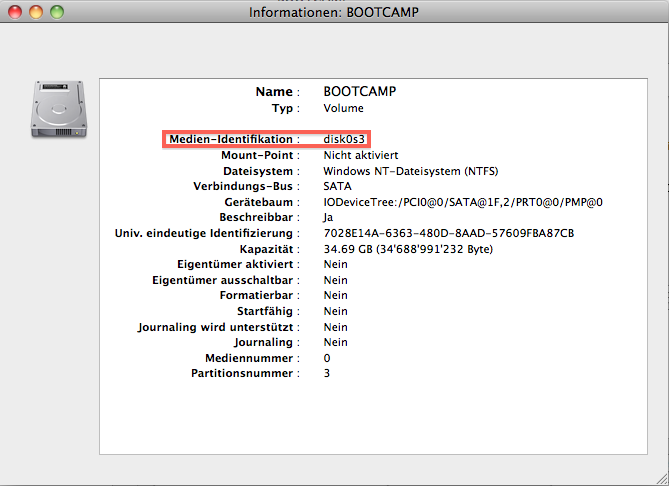 Note: If you decided to format your Boot Camp partition with NTFS, then it won't be accessible from OS X. In this case, it won't be mounted as well. This is the case for me, so I effectively left this step out. To have this settings parmenently applied to the system, you will need to add them to the local boot script. For this purpose, we use the "nano" command, a simple text editor which is simpler to use then "vi". Just type and quit using the "CTRL-X" key stroke. Chances are that this file does not yet exist, but never mind, it'll be created automatically. Again, if the Boot Camp volume is NTFS formatted, it won't be mounted anyway, so the "diskutil" line can be omitted in this case. Type "CTRL-X" to save and exit. Please note that this time, you won't need to give the whole "disk0s3" string to the command above. Instead leave the last two characters away, just stating the physical disk name, which is "disk0". You will need however to supply the partition number "3" taken from the "disk0s3" string to the "-partitions" argument as seen above. Simply follow the instructions of luckyviplav's howto. It is effectively required to remove the disk from the SATA controller and attach it to the IDE controller as primary master instead. 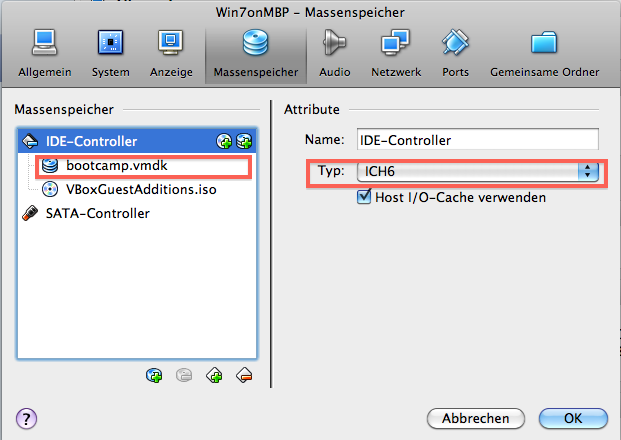 Also do not forget to set the IDE controller type to "ICH6", otherwise you'll get a "STOP: 0x0000007B" BSOD (Inaccessible Boot Device)". So you're now ready to boot your VM off the Boot Camp partition. Note: If you want 3D acceleration, you'll need to install the VirtualBox drivers from safe mode (press F8 during boot to get into safe mode). 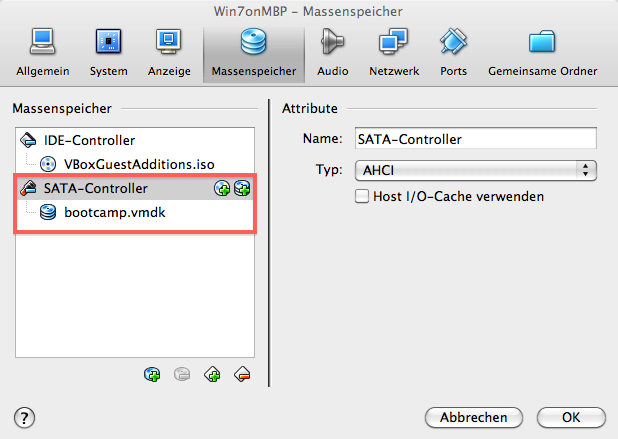 So here's finally our Windows 7 VM bootet off the Boot Camp partition. And yet, it's still possible to run the very same Windows 7 natively by booting directly into Boot Camp.